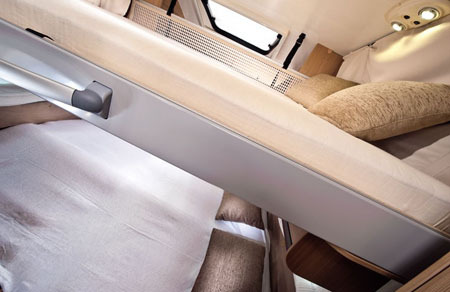 There’s no doubt compact coachbuilt motorhomes with drop-down beds are really starting to catch the imagination. 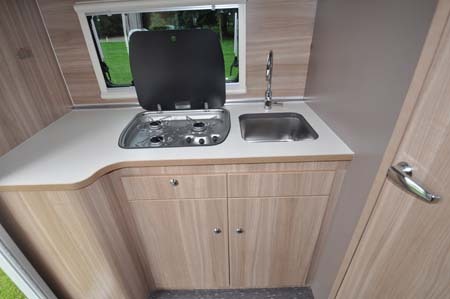 Like this Adria, they offer four-berth accommodation with plenty of self-sufficiency equipment and – arguably even more importantly – the space in which to live and enjoy it all. 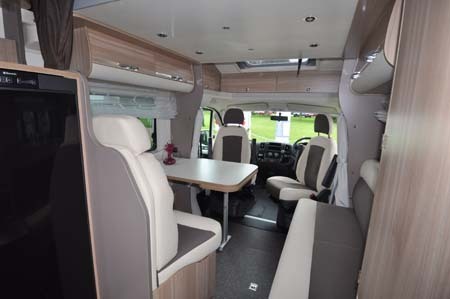 Yet, it’s under 6m in length – if you like, a metre longer than a Ford Mondeo estate; or the same as a long-wheelbase Fiat Ducato van, but with the coachbuilt body allowing superior interior room as well as insulation qualities. Unlike, its main rivals, this Axess is built on the short-wheelbase chassis-cab, which means there is still a bit of a tail overhang. 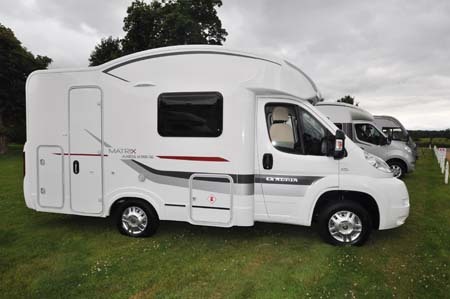 Nevertheless, it’s in models like this where Fiat’s Ducato really does excel as a motorhome base vehicle. Overall performance and economy are excellent (considering all the home-from-home facilities you have on board, and there’s no doubt the compact body on the back helps contribute to excellent road behaviour all-round. Compact, maybe, but it certainly does pack a lot in. A forward lounge that includes the cab seats swivelled, an inward-facing settee and a forward-facing travel seat with three-point belts. 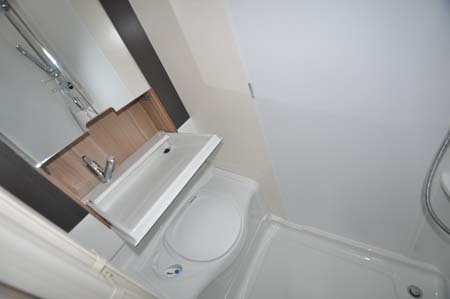 A decent sized washroom that includes space for showering, a bench toilet and smart drop-down sink. A kitchen across the back. And some very handy exterior-access storage space, also across much of the rear. Typically Adria, it’s all built to a very sturdy standard, too. Outside, the graphics have been updated for the season ahead and, although the model featured here is in all-white, there are options to enhance the look with metallic paint finish for the cab, alloy wheels, LED day-running lights etc. Inside, it’s a new, slightly warmer wood finish for 2014. But, more exciting is the main bed, which is now electrically operated – although this is part of the hard to ignore All Inclusive Pack of options (as detailed below), but which nudges the on-the-road price over the £46,500 mark – still highly competitive for this sector. The Plus Pack also knocks some 74.5kg from the payload, although the starting figure is significantly high not to merit considering any kind of chassis upgrade. Adria uses a bed system that works well, too. Admittedly, it’s slower than most when it comes to raising and lowering, but it also hints at a more all-round sturdiness that bodes well for the longer term. Benefiting from a single mattress, that drop-down bed is a comfortable enough 1.93m x 1.38m, while the additional double from the lounge seating is an equally acceptable 2.10m x 1.50m. 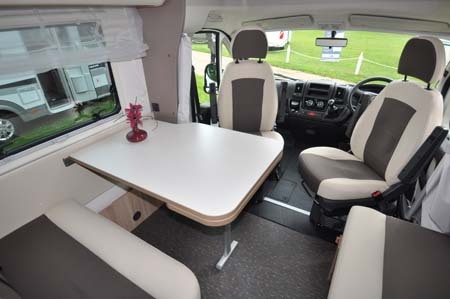 The electrical upper bed facility means you can lower the section right down for easiest access (a metal ladder is also supplied), or just to a height where it’s still feasible to use the lounge seating, or have sufficient headroom for the lower bed. Key also is, whatever its setting, that main bed doesn’t intrude across the habitation door (on the offside) or indeed access to the kitchen or washroom. The former is actually rather good in offering a three-burner hob, separate sink and a decent amount of worktop, while adjacent there’s a massive, 170-litre fridge/freezer. There’s also the added bonus of a microwave oven (at a sensible low height), again thanks to the All Inclusive Pack. It’s storage in this kind of a vehicle that you have to pay close attention to. 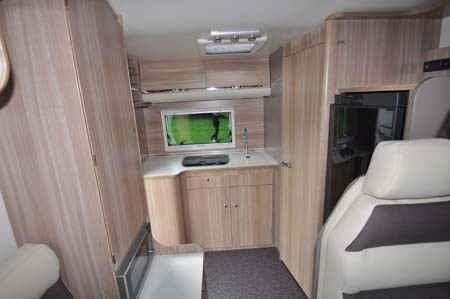 The Adria differs to its rivals in offering lockers to the overcab area (rivals tend to go for open shelving, if anything). Space under the kitchen worktop offers the choice of cupboard area for foodstuffs etc, or it can be used wholly as part of the exterior-access locker section. There’s also an exterior-access gas locker (it’s surprising makers haven’t latched onto the use of underslung gas tanks as a means of saving space as well as long-term better value for gas consumers – they’re certainly becoming more popular on van conversions, for these very reasons). 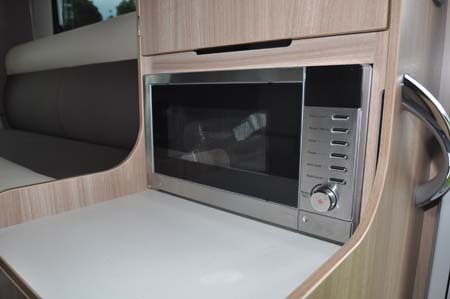 There’s more information on the Axess 590 on the Adria website and to find out more about our low-cost premiums visit the motorhome insurance discounts page. Looks good but no living space available when the bed is down, and hate the drop down wash basin. Good for the money but much prefer our Hymer A-Class B584, on the Al-Ko chassis only just a fraction longer. About time another manufacturer took notice of the tardis like Hymer Exsis(2004-2007), an excellent van,even shorter at 5.45m.